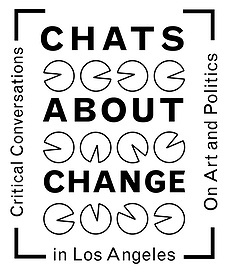 Chats About Change: Critical Conversations on Art and Politics is five conversations addressing contemporary themes creative practitioners are developing in Los Angeles today. Organized by artists Elana Mann and Robby Herbst, the conversations will explore ways individuals, at times labeled “artists” and “organizers,” are seeking alternative futures. The first part of the project will take place at California State University Los Angeles, deemed the “people’s university” on Thursday January 15, 2015. The second part will be held at LACE on Saturday January 17, 2015. Assemblies will be structured around the problematics surrounding participation, creative dissonance, spirituality, professional-hybridization, and the politics of land in a session co-organized with Sandra de la Loza. Chats About Change asks questions, wages debates, and strengthens community among people seeking experimental ways to affect Southern California. The chats are a series of conversations around a set of questions. To similarly involve our community, we invite you to participate in a process inspired by a Zapatista consulta. You will be asked to develop a question addressing the nature of social change practice in Los Angeles. The dissident is known as an individual acting in opposition to official policy, dogma, or practices of a society. The individuals in this conversation have a dynamic relationship to concepts of oppositionality, some may welcome it, some may not. Their work, addressing gender, policing, ideology, and the Veterans Administration, will be a starting point for a conversation about how art can be instrumentalized into a critical discourse. Participation in anything is often a question of motive and use, opined Allan Kaprow in 1977. Today participation is considered the democratic standard, while the structures initiating this participation may not be fair, just, or desired. This conversation will explore the variety of motives, uses, and strategies of participation happening in Los Angeles. Recent critical frameworks including Institutional Critique, Feminism and Identity Politics question the relationship between ethics and aesthetics complicating the artist’s role in society. And we are not finished. Where ethics connotes social responsibility and aesthetics imply that anything goes, what motivates artists to weave the two together and take on social challenges larger than a singular artistic voice? Where do artists “find” themselves in the confluence of individual expression and broader social relations? This chat will address these questions reflecting on the personal choices artists make and the multiple roles they play. The creative impulse is not contingent on inclusion in institutions of contemporary culture. Social change art is defined by its interdisciplinary nature, hybridizing strategies from art and sociology to activate a public sphere. Partnering with governments, community groups, and otherwise, this dialogue involves practitioners who’ve insinuated their projects in sites beyond the art world’s mediating radar. This chat will explore the modalities and problematics of collaborating in and out of diverse (non)institutions. As the final act, we’ll gather to beehive. We’ll call out topics and issues we’re interested in discussing. After a dozen or so topics are compiled, everyone will be invited to congregate around a topic of their choice, in small groups, like bees at the hive. For more information on the project, visit www.chatsaboutchangela.org.